Chiropractor Completes Branding with Vinyl Window Perf! Who uses a van vinyl window perf in Bartlett, IL? Loyal readers of the Mark Your Space blog know about the recent vinyl window and graphics upgrade that local chiropractic specialist Dr. Robin Ackerman undertook for her Balance Family Chiropractic offices. We installed a new lobby sign, window lettering and interior glass pane graphics that add pizzazz to the space. She is now marketing her family chiropractic clinic to consumers with the help of a rear window perf that we installed on her Land Rover. The picture showcases the name and logo of the practice and highlights some of her achievements. It also underscores the fact that Balance Family Chiropractic takes in adult as well as pediatric patients. A website address and telephone number offer contact options. The picture showcases a happy baby and mother. This highly effective marketing setup is sure to turn heads and generate plenty of interest in Dr. Ackerman’s services. Now, imagine if you had the opportunity to do the same with your medical office! Offer contact options. A website address and phone number make it easy for prospective patients to contact you. Whether you run a dermatology office, a veterinary clinic that specializes in cats only or a pediatric dentistry business, a rear window perf is an excellent means of getting your name out into the community. It is true that many folks will ask a friend or trusted doctor for suggestions in these cases, but those who are new to the neighborhood may not have this type of support network in place. They will appreciate seeing your advertisement. Highlight your niche. Niche advertising is a powerful tool to market your clinic and brand your name. In some cases, it may also be a good way to re-brand your office. The latter is frequently the case when two professionals merge and expand the menu of services that are now available because of this partnership. While the chiropractor highlights that she treats children as well as adults, you might underscore that you focus on the geriatric patient or specialize in high-risk cases. Show off (just a little). It is okay to spell out the awards that you have won. There is nothing wrong with pointing out that your Yelp reviewers love you. Having earned a prestigious degree or accreditation is a valuable piece of information that can influence someone’s decision to seek out your services. By highlighting her credentials and accolades, Balance Family Chiropractic’s specialist generates trust with those who see the window perf. You have the power to do the same thing. When you are ready to turn your car, van, truck or other automobile into a highly effective marketing and branding machine, our experienced vinyl window perf installers gladly go to work. We measure the window and outline its shape. We also note the dominant color of your vehicle since this greatly influences the base color of the vinyl. Next, we use any artwork that you already have on hand. If you are just now starting from scratch, we work with you on the choice of graphics. Our stock graphics may just be what you are looking for. Installation is quick and professional. You are going to love your car’s new look! 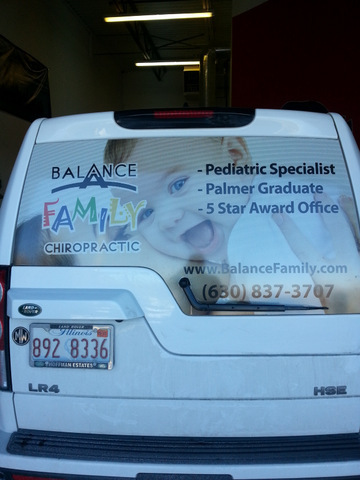 Title: Balance Chiropractic Completes Branding Campaign with Vinyl Window Perf!